Star forward Kawhi Leonard wants the Spurs to trade him, league sources tell Jabari Young of The San Antonio Express-News. Multiple outlets have confirmed the news, with Shams Charania of Yahoo Sports writing that Leonard has “grown uncomfortable” in San Antonio and would like a change. Sources tell ESPN’s Adrian Wojnarowski (Twitter link) that while it seems clear Leonard wants a change of scenery, he has yet to express anything directly to the Spurs about his future, and the team won’t rush the process. According to Wojnarowski (via Twitter), Leonard – a Los Angeles native – has L.A. “at the center” of his preferred landing spots. While the Clippers could offer a compelling trade package and plan to pursue Leonard aggressively, per Marc Stein of The New York Times (Twitter link), the Lakers are atop his wish list, Wojnarowski adds. Meanwhile, ESPN’s Ian Begley reports (via Twitter) that people close to Leonard have expressed a desire for the 26-year-old to play in New York, though the Knicks might have trouble putting together a viable trade package without including Kristaps Porzingis. Chris Mannix of Yahoo Sports adds the Kings to the list of teams who could kick the tires, tweeting that Sacramento has talked to teams about the No. 2 overall pick and “desperately” wants an established star. The Sixers have also been cited as an asset-rich team with interest in acquiring Leonard, and the Celtics would fit that bill too. Boston reportedly made an offer for Leonard at the 2018 trade deadline, and Wojnarowski reports (via Twitter) that the C’s still have interest. Leonard is just a year away from being able to reach unrestricted free agency, so he should be able to assert some leverage in the process depending on how willing – or unwilling – he is to commit long-term to certain teams. However, as we saw last summer with Paul George, who also wanted to join the Lakers, there will likely be clubs willing to roll the dice on a player of Leonard’s caliber without any assurances that he’ll stick around for longer than one year. Of course, in George’s case, he was coming off a healthy, productive season, which can’t be said for Leonard. As we’ve written throughout the 2017/18 league year, Leonard and the Spurs were at odds this season over the diagnosis and treatment of a troublesome quad issue, with Leonard’s own doctors disagreeing with team doctors about the nature of the injury. That disagreement has been a source of tension between the Spurs and Leonard’s camp. The veteran was also reportedly put off by having his status questioned during a players-only meeting. There was a belief that the Spurs and Leonard would look to mend fences this offseason, especially since the former first-round pick is eligible for a “super-max” extension that would start at 35% of the cap and would pay him well over $200MM for five seasons. 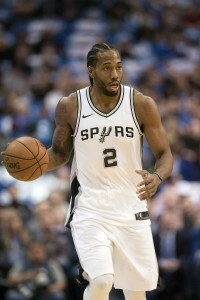 San Antonio is the only team eligible to sign Leonard to such a deal, though there was no guarantee that the club would put that offer on the table. If Leonard is traded, he’d be eligible next summer to sign a five-year contract worth up to 30% – rather than 35% – of the cap. According to Chris Haynes of ESPN.com (Twitter link), Leonard isn’t worried about the possibility of missing out on the super-max. Haynes adds that there’s a “feeling of betrayal” on Leonard’s side that at this point appears irreparable, as the two-time Defensive Player of the Year feels like the franchise turned on him after he sought a second opinion on his quad. Per Haynes, Leonard and Spurs head coach Gregg Popovich have been in touch in recent days, but have yet to speak in person. Although a number of teams figure to be in the mix for the former NBA Finals MVP if and when San Antonio begins taking calls, it’s hard not to see the Lakers as an ideal fit, assuming the Spurs aren’t committed to sending him to the Eastern Conference. Besides being Leonard’s preferred destination, L.A. also has several young players that could intrigue the Spurs in a trade, and has indicated that none are untouchable. The Lakers would still have more than enough cap room to add another star in free agency after taking on Leonard’s $20MM salary for 2018/19. They’re also projected to be so far below the cap that they wouldn’t necessarily need to match salaries in a deal after July 1. When the Lakers weighed a George trade a year ago, one key question they had to answer was how much they were willing to surrender for a player who might simply head to L.A. as a free agent 12 months later. The franchise figures to face a similar dilemma this offseason as it considers trading for Leonard. If the Lakers are confident they can land another star or two, it may make more sense to go all-in for Leonard than it did with George in 2017. Sixers would be dumb to give up all that for one year of Kawhi. He’s signing in LA next year. Best thing for the Spurs would be to try and get Ingram from LA. Yeah I agree it would be, but didn’t Pop say he would never give up kawhi to any western conference teams. Now can you see it all coming together? LeBron to the Lakers, like a lot of us have been saying. Kawhi trade to the Lakers like a couple of us have been saying. Paul George free agent to the Lakers. Stretch Deng, trade Ball & Ingram, account for maybe 7 FA fill-outs… only about $20MM left for George. Also means zero chance Lebron goes there. Not necessarily. The Lakers would have enough space for George and LeBron (or two max free agents) if they are able to get rid of Deng’s contract (via stretch provision or trade). However, if they convinced a team to take Deng’s contract in a Kawhi deal, the Lakers could still have room for two max free agents. They’d likely have to part with Kuzma and one of Ingram or Ball (Ball is set to have a higher cap hit this season) as part of a deal, but its possible to fit in all three. I think he meant to the Spurs. Lakers have enough money for two max contracts – even with Deng, but they have to let Randle walk. Other realistic contenders could be Celtics, Cavs (if they can really make it work and keep lebron). Zero western conference teams have a chance hate to say. Yet he Leonard just said he wants to go to LA. they have the young pieces and draft picks to get it done too. Cavs don’t have any movable pieces so I can’t see Cleveland. Spurs wouldn’t move a top 10 player when healthy for the likes of Clarkson, Thompson, JR or Nance. Did he though? It’s not he made an announcement stating he wants to leave San Antonio. This is just what is being reported, it could be fabricated or leaked in order to pressure the Spurs into offering him the supermax as a last ditch effort. Yeah he did now, I posted my comment before the announcement, however I still won’t buy that he’s gonna be traded to a western conference team. The only way the Spurs get a decent haul back is the Lakers. Deng doesn’t have to be part of the deal, unless the Lakers want to get rid of him and offer more to do it. Lakers could take Leonard’s salary and LeBron without moving Deng. I don’t the Spurs giving him a Super Max was ever an issue. Well the Cavs do have the #8 pick. That is a better pick than they could get from any other team. I agree though he most likely won’t go to Cleveland. But if the Cavs could pull off a miracle and get him I think LeBron absolutely stays. Again it would take a miracle for the Cavs. How is the 8th pick better than one they could get from any other team? Literally 7 better picks, and many of those teams willing to deal. The article even mentions the kings being interested. The Spurs gonna challenge Dallas for worst team in Texas. Exactly, “Ok” you never want to be just “Ok” in this league. That’s how you end up like the hornets and the blazers, loaded with garbage contracts and no high draft picks. ^ A man that gets it. I think the Blazers are a little bit better than okay. They’re actually pretty good, the number 3 seed in the loaded West this season. I’ve seen some mention oubre and porter, but I think it would take more than that. That will never happen as they have no cap space to fit in two more studs with LeBron. Lakers Lakers Lakers. What would the asking offer be ? 1st rounder plus 3 starters ? Without a commitment long-term: expiring contract, 1st rounders, good player..
Leonard and Lebron either on the Lakers or Knicks book it. Lol they’re definitely not going to the Knicks. Knicks don’t have the assets or cap space to make that happen. As a spurs fan, i would love for him to stay. On other hand if he doesn’t want to stay and work things out with front office,popvich and other players then trade him. I would trade if to clippers. I believe they can’t trade him if they extend him, not before the draft that is. I think for Dekker, Teodosic, one of those first rounders plus a future first rounder with some heavy protections, the Clippers would do that. That Clipper package is crap. The Clippers are the laughing stock of the league and they always have been. Hopefully they turn it around in the next couple years with Jerry West and a decent owner. Sam Dekker? Please. The Laker package is awesome it’s a no-brainer guys. He’s not going to the Wizards or the bucks or the Cavs or the Celtics or the Blazers. Lakers Lakers Lakers. No one else will give the Spurs a decent package because they know he won’t resign there. The Lakers know he’s going to sign long-term so they will give up those young guys. Why doesn’t everybody see this, especially after the news today? A few of us been saying these things for a couple of months. How do you not sit on the bench with your team in the playoffs? Gone !! Hello. Spurs would never do it. I am on the fence with the Sixers trading for Kawhi. Mandatory that Bayless is included in the trade though. I’m more inclined to trade for Kawhi IF: Michael Porter Jr. or Mikal Bridges aren’t available at 10. You may be like “Kawhi > Porter/Bridges” but I get them for 4 years <15M… just a lot more flexibility. IF I do trade for Kawhi. It's #10, Fultz, Bayless. If I'm including Saric then I have to be 100% confident I'm landing one of LeBron, PG13, Jabari Parker or Aaron Gordon. Otherwise, now I have a big hole at PF even with Bolden. Otherwise they can take their pick of Bolden, TLC, Anderson, Korkmaz, a draft & stash, or a couple 2nds. The injury and quitting on the team are bigger issues for me than they may be for others. What type of player and what mindset am I getting? I don't need disgruntled players messing w/Embiid & Simmons. 100% healthy Kawhi is Top-3 in the league, that's not up for debate. But am I getting 75%, gulp… 50%? lol that's the issue. If I get 50-75% of Kawhi, I have like Robert Covington… and I traded away a lottery pick, #1 overall pick, and a stretch-4? No way you’re getting kahwi for that mess… Lol.. You’re going to have to give up Simmons to get him.. And if I were a sixers fan I’d hope for it.. Because Simmons can’t shoot to save his life.. And is the absolute most overrated player in the NBA bar none.. It’s got to be Simmons and saric at least.. No way the spurs want fultz. In what world do you live in? Ben Simmons was a top 15 player in terms of VoRP last season, which was his first playing in the NBA. Keep drinking that haterade. There is a less than zero chance the sixers would trade Ben Simmons. Actually that’s a good take. Nothing wrong with it at all because if LeBron signs and Kawhi is traded there I would give up Simmons. You wouldn’t? But LeBron’s not going there. Lakers Lakers Lakers. By the way I’m a Warriors fan…. They would have to trade for Kawhi before signing LeBron – no guarantee there. I agree that there’s no chance Simmons gets moved, but Simmons for Kawhi straight up (if Kawhi agreed to resign) wouldn’t be a bad move. Kawhi is far and away the much better player if healthy. And until Simmons learns how to be a threat from outside 5 feet, his ceiling is a slightly better MCW. Considering that Simmons is likely going to get a max contract, I’d feel much more confident in giving Kawhi a max contract before Simmons. Simmons max vs Kawhi max is like 25M vs 40M tho. The list of guys that teams would never trade is a short list, and both Embiid and Simmons are on that list. I’ve heard pundits say the Spurs would require Ben Simmons or Joel Embiid for Kawhi Leonard. Is this uninjured Kawhi? Is this locked-in long-term Kawhi? No. This is 1 year, ready to opt-out, needs a max contract, might bolt to LA anyway Kawhi Leonard. The package requirement for him is going to be much less. Especially if their relationship is TOXIC and he says he wants OUT. You’re basically asking for a young LeBron James back in this trade. Less than zero % chance of that happening. If Pop even brought that up, they’d tell him to “STAY OFF THE WEED” so you might as well too. Whatever package he gets traded for will be underwhelming. The Lakers 100% have to up the package, b/c for them to fulfill their master plan, Spurs have to take back Deng. They can’t add Kawhi and give up Kumza & Hart and still sign PG13 and/or LeBron James. They would only have ~42M in cap space. So it would be one or the other, not both. OR they can just sign PG13 and LBJ and not trade anyone. Ingram isn’t untouchable. Ball kind of is, b/c who wants to deal with that nonsense? More like undesirable. So with Kawhi playing the same position, you could go Ingram + Hart + 25 + Deng. Ingram > Kuzma. Heard he wants to be a laker! Does lakers trade Lonzo ball for kawhi? I would have to think it would be him or Ingram. Luel Deng, kuzma, Ingram. Not Lonzo ball. He stays. Maybe a pic, maybe something else, whatever. Pass-first point guard stays. Ball might have to be included since his cap hit is higher (thus making it easier to match salaries). Plus, if LeBron goes there Ball loses half his value as a pass-first point guard since he wouldn’t have the ball as much. If Kawhi and PG were to go there too, the team would have enough between Ingram, PG, and Kawhi to be the ballhandlers when LeBron sits. Realistically, the hypothetical Lakers package for Kawhi all depends on who the Spurs value more. A guaranteed three years of Lonzo (and his dad) or two years of Ingram. Personally I think the Spurs should ask for Ingram since his ceiling is higher but if I’m the Lakers I’d rather move Ball in that deal. Salary matching is not required. Lakers have 62M in cap space. to get rid of LaVar? Not enough from the Lakers. Lakers would need to find a taker for Deng and one of Kuzma/Ball/Ingram are not enough for Kawhi on their own (even with this news). Would likely have to be Deng, Kuzma, and Ball/Ingram for Kawhi. Only see the Lakers making that deal if at least one of PG or LeBron commit to signing with them. The reason Ball/Ingram would have to be included is to get rid of Deng’s contract. Kuzma isn’t enough to get Kawhi straight up and adding Deng only makes that deal worse for San Antonio. Sure the Lakers could offer the Cleveland pick or other future firsts but those aren’t going to be too valuable since they will be late first rounders. Kawhi and Lebron would be epic for LA. maybe they can find a way to fit Cousins in as well. Three of these guys are coming to the Lakers LeBron Kawhi Paul George Chris Paul DeMarcus Cousins. Outside of the organization pushing Kawhi to come back when he wasn’t ready, when did the Spurs mistreat him this past season? His injury was supposedly less serious than Parker’s and Parker came back first plus Kawhi was medically cleared to play at one point. I’m all for a player coming back from injury to take their time and be prepared both physically and mentally, but it seems the whole root of the issue was that Leonard wasn’t mentally ready (and/or fully in shape) to come back and play when he made his brief appearance. I find it hard to blame the team for wanting you to come back when you’re declared medically fit to play especially when the Spurs were in the middle of a decent season without their superstar and the Warriors were the weakest we have seen them in their past four years. If someone wants to come home and play for the Lakers they’ll find a way to make it happen. Oh you mistreated me, oh you wanted me to come back early, oh you didn’t allow me to seek a second opinion. Whatever it takes truth or not. Just think, Kawhi had to carry that team by himself. He brought the ball up the floor, he took all the shots, he guarded the best player on the other team. He’s tired of that crap and so is LeBron. Welcome to the Lakers Lakers Lakers. So Kawhi, and LeBron, are tired of playing like a superstar? They’re tired of having the responsibilities of a top-tier two way player? Also, I’m pretty sure Kawhi did not bring the ball up the floor or take all the shots as much as you seem to think he did. Having that much responsibility and getting the numbers/money that they are getting go hand in hand. You want to average 20 points (amongst other stats) and get paid like a top player, well guess what you’ve got to play like one which includes ball-handling duties, taking shots, and actually playing defense. The spurs werent far off of 50 wins without him. What carrying? I’ve said before too that the ‘here Kawhi, this franchise is now yours, try and live up to Timmy’ sentiment and all of the Spurs family vibe could become claustrophobic for an introvert like Leonard. I’m just saying they are tired of carrying the entire load but not winning rings. Sure its great to be the Superstar and all the accolades but they want to win and get support from teammates. If I’m the Lakers and can get a commitment out of him no one is untouchable he’s a top 2 defensive player and top 10-15 offensive player when healthy. Sign PG and hope you can sign Boogie for cheap. Randle is a FA, his trade value is basically nothing at this point. The Lakers won’t resign him if they go after big free agents so the Spurs aren’t going to want him in a trade when they can just sign him outright. LA would have to give up a ton. Spurs have the upper hand all the way. No they dont lol. They can wait 1 year and give up nothing for him. LeBron is 33 years old and a ton of miles on his body. He’s tired. Kawhi Leonard is coming now, so is LeBron and maybe cousins or CP3 or George. There’s no waiting a year. They’d be giving up going after at least one of LeBron/PG/Cousins doing so. Since Kawhi likely gets traded at this point, the Spurs could turn around and trade Kawhi elsewhere for the best offer possible. You then run the risk of Kawhi choosing to resign with that team and not going to the Lakers. That’s the risk the Lakers played by not making a move for PG. Maybe it’ll all work out for them in the end but you never know. It’d be absolutely hilarious if PG decides to resign in OKC though. Sometimes fences can’t be mended. No one knows his personality and what went on behind closed doors between him and the Spurs. He sees others pulling in those marketing dollars. LeBron, KD, Curry, Kyrie, etc. He sees others pulling in those marketing dollars. LeBron, KD, Curry, Kyrie, etc. Probably feels left out in the money game. Are you looking at NBA teams? Did you watch the playoffs? Clarkson is worth 0 and he’s making huge dollars. He’s not an asset at this time. Clarkson and Thompson aren’t that valuable. Nance has some value but his ceiling is a rotational high energy big so his value is limited. Its unlikely to happen but a package around Nance, Osman, the #8 pick, and salary filler might be an appealing consolation option for the Spurs if the Lakers completely lowball them in a trade offer (similar to what the Pacers dealt with in regards to Paul George). LeBron would rather have me and you versus the Warriors than Clarkson, JR, et al at this point. There are better packages that other teams can offer, but these at least won’t make Spurs laugh. Not sure if SA will rebuild at this juncture. Rebuild Pkg: Osman, Zizic (or Nance), JR, #8, 2021 1st (1 yr, top 3 protected) and 2023 1st (0-1 yr, top 3 protected). JR is the easiest guy to stretch. Win Now Pkg: Love, Osman, #8. SA would return White (PG) in addition to KL. Personally, I feel like the Heat have pieces to get a deal done, but not good enough to top Philly or maybe someone else. Waiters, James Johnson, Mcgruder, and the 2019 1st round pick for Kawhi and Patty Mills is probably the best offer the Heat can realistically make for Kawhi where it would make sense for both teams. What’s up with Philly fans thinking Fultz has ANY trade value? Yeah he was the number 1 pick but that was before he broke his jumper and didn’t really play this past season. Looking at redrafts some have said they wouldn’t even pick him in the first round based off this season. Even if his shot never returns he has the skills to get to the dish at will. And the handle and passing ability to handle the point. Hes not MCW, hed be more Rondo, poor mans John Wall at that point. Redrafts are always the stupidest things to look at, especially after one season. Its basically a power ranking of the best players from that draft. Doing a redraft after one year is stupid too because you can’t put an accurate value on a player after one year. For example, if you did a redraft of the 2016 Draft for the 2017 year, Ben Simmons probably doesn’t go in the lottery since he missed the entire year. From what I’ve read, scouts are optimistic about Fultz going forward. He’s been working with Drew Hansen (who has worked with Beal and Wiggins just to name a few) who is a well known personal trainer for basketball players and has supposedly been reworking his shot. Yea, Tyreke Evan’s and MCW won rookie of the year. Both are journeymen. MCW just about out of the league. Chill dude. Dont take it so personal lol. I did say that wasnt happening. Kings would draft Porter in this scenario…How about Whiteside for Randolph, Temple, and the #36 pick? Kings have new ownership and management, but not a new fan base. They wouldn’t take Whiteside under almost any circumstances. Any of the other 27 teams would be a better phone call. It’s not Leonard’s leverage that increases if Leonard expresses his willingness to re-up with a potential new team. It’s the Spurs’ leverage. It’s 1 year until he’s an UFA; he should give no guarantees. The worst case is the Spurs keep him (5% chance). Otherwise, he’ll be traded to a good team. Or a delusional team in a top market. Speaking of which, I hope the Knicks, for their own benefit and the sanity of their fanbase (or what little we have left), need to stay out of this. Lousy teams that make win now trades for star players do build championship teams, its just never their team. Don’t even kick the tires. If they want to go big game hunting, draft the right guys this year and next, shed some salary, and be ready for next summer. If Phil Jackson was still running the Knicks I could see him trading Porzingis. Why anyone would give up a large amount of assets for a guy who hasn’t proven he can get back on the court is beyond me. But I do think the Spurs need to move him, I’m sure the locker room was tired of all the Leonard questions. He will attract other star players. That’s why you’d move KP for him. And it’s not like the Knicks know for sure that KP comes back as the same old KP. In no event would Jackson trade KP for KL. I’m more worried more about the current regime. I don’t have a sense yet whether or not Perry has what it takes to build a contending team. I have no doubt that Mills does not. As Mills is in charge, and Dolan still lurks, anything (no matter idiotic) is possible. Even forgetting contracts, KL, without KP, does nothing for them except end the building process and maybe give them some low end playoff teams. KL is a FA next summer. The Knicks can pursue him then if he wants to come to NYC. If he doesn’t, then he’ll leave anyway. NYC isn’t a place you come to indifferently or stay due to inertia. Julius Randle sign and trade, no Ingram or Kuzma….draft picks, ok, Ball, ok.
1. Randle wants big money and he may get it from Dallas, does San Antonio want to dump 60M into the PF (Aldridge and Randle)? 2. Does anyone in the league want the Ball Saga? Spurs can sit back, make a multi team trade and come out with crazy amount of picks and players. You continue to forget what pop and rc can do. Kawhi just has his uncle pulling his strings. Grass always looks greener on the other side. This is the spurs. One of the top rated franchises year after year. Hate to say it, but Leonard has zero leverage. If the spurs trade him it will be for the best package the spurs can get. Where Leonard wants to play is irrelevant. Getting Leonard for even a year will be a gamble most teams would make, and will make offers that account for the gamble. Like Paul George, if the Lakers think they can get Leonard in free agency why trade for him? His leverage is saying publicly he wont resign with a team. If the Spurs are willing to (or forced to, which is more likely) take a rental package, then they’ll send him wherever they want. KL has no leverage as to location, but Spurs have no leverage as to the return package. Still, even at a modest rental price, a bad team won’t have interest (because then it’s a 100% a rental and might keep them out of the lottery, not to mention he may a problem in the locker room). The exception being the Knicks, because .. well, just because. But, as to his 1 year home, KL will be OK.
Lakers can’t sign KL next year, if they sign PG13 and LeBron this year. Even if they shed Deng and other salary between now and then. I don’t think they’re going to get all 3 of these guys this year either (but they can dream). I think Pop would never trade KL to the Lakers without getting 18 mm or so of the Lakers cap space back in a TPE. KL’s contract situation right now suggests to me that no team (including the Lakers) is getting a full extension next summer. I think it will be in increments until he hits 10 years (summer of 2021) and can get the 35% max that he’ll be denied early by leaving SA. Move isn’t driven by $$, but that doesn’t mean he’s not doing it knowing there’s a way to recoup this and end up in the same place. I don’t like the Spurs spot here. They may be forced to choose between several unattractive deals. KL threw them a bone by mentioning LA, but he may know that Spurs are unlikely to send him there, and by saying it he hurts their market for non-LA teams. I’ve said I have my reservations. No matter how good he is… am I getting damaged goods? Plus I haven’t seen him play a game since.. what Feb? I know I do get stick for that, but to me Kawhi is at the most a top 20 player when healthy & at 100% so I wouldn’t give much for him if Lakers definitely not Ball (star player) nor Ingram or Kuzma, if Philly I ain’t giving Fultz or Dario. By the way if Simmons is a phenomenon, the guy is gonna be an absolute legend. Realistically I don’t care much where Kawhi goes don’t think will make much of an impact in the league, he only won riding Duncan’s tail.